The mind is powerful. Many people do not realize how much their thoughts can control their entire outlook on life. Your brain helps you successfully get through the day in many ways. Take a moment right now to think about everything you do each day, and then consider how your mind is involved. Chances are, you’ll realize that your thought processes are a part of every single thing you do; no matter how big or small the activity. While the mind is beneficial to you, it can also hurt you. Yes, your mind could be doing you wrong. Remember, your mind is powerful, so it can either help you or hinder you. Think about personal struggles you’ve had over the years. Thoughts can become overwhelming distractions that make completing tasks difficult. Your mind interfered. Let’s now think about how your mind affects the way you think about yourself. When you look in the mirror, what do you think? Do you point out all of the flaws, or do you notice what you like most about your features? If you’re like many people, you immediately notice the flaws. You may poke and prod at your face and body frowning the entire time. In haste, you might throw your clothes on and exit the bathroom in disgust. Some people look in the mirror and think the opposite. They tell themselves they are having a good hair day, or how flawless their makeup makes them look. When they see something wrong, they immediately think about what they can do to improve it. Instead of being disgusted, they move into action. In both examples, the body and face are imperfect. None of us are without flaws! In the first example, the person left the house feeling down, and that can affect the rest of their day. In the second example, the person started their day feeling motivated and powerful. They decided to do something to help feel more beautiful than they already are. They took a moment to recognize their beauty and validate it. The second group obviously has the advantage! How can you join the second group? Change the way you think. Recognize you uniqueness and beauty. Appreciate the gorgeous person you are! 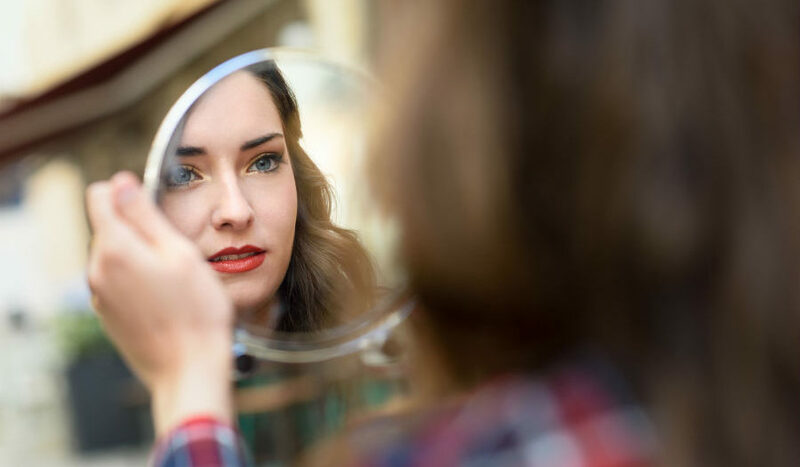 The next time you’re looking in the mirror, think about what you love about your look; stop focusing on what is “wrong” with you. If you’re concerns about the aging process (as many people are), consider reaching out to me for fillers. My services can bring back volume and fill in wrinkles and creases. If you have acne scars, you don’t have to live with them; call me for a consultation to discuss the solutions I have that can help. Life should be enjoyable. Take control of it and make it good. You can do that by taking action on what is bothering you. I specialize in cosmetic enhancements that can make you feel better about yourself. I can help you change your perspective about your beauty. Call or text me now at 917-860-3113 or call during normal business hours at 1-844-iBOTOX-Now. I proudly serve residents in Suffolk County, and the surrounding areas of Long Island and beyond including East Setauket, Islip, West Hampton Beach, Commack, Manhattan, Brooklyn, Rockville Centre, Farmington, Babylon Village, and Huntington Bay, New York.